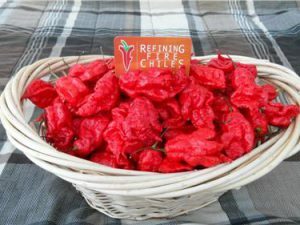 Carolina Reaper-(Capsicum chinense)-This is an extremely hot variety developed by a grower named Ed Currie. It is also called HP22B pepper. 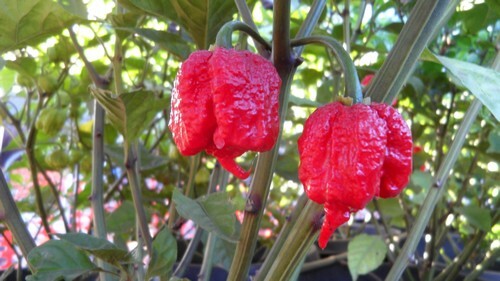 As of 2013 it has has become one of the worlds hottest peppers. It is over 7 generations old. 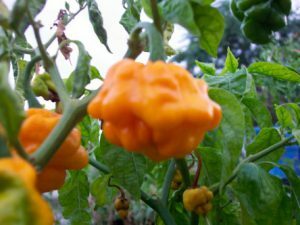 Ed created this chile plant variety by crossing a Pakistani Naga with a Red Habanero type from St Vincents Island in the West Indies. It is similar in looks to the Trinidad 7 Pot Primo. These chile plants grow slow in the beginning like Nagas but are very productive. 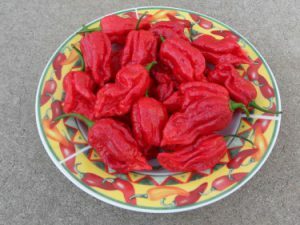 The Carolina Reaper has a nice fruity flavor similar to other superhots like the 7 Pot. YOU ARE GETTING 5 DRIED CAROLINA REAPER PEPPERS. REAPERS ARE NOT LARGE PEPPERS SO WILL BE SMALL WHEN DRIED. THE PEPPERS CAN GET CRUSHED DURING SHIPPING AS THEY ARE FRAGILE. 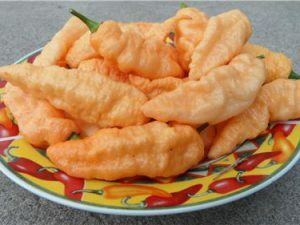 PEPPERS HAVE SOME SEEDS INSIDE BUT ARE NOT VIABLE AS WE DRY AT HIGHER TEMPS TO KILL GERMS.